My 13-yo daughter wrote the following speech to give to her 8th grade English class. While I continue to eat (guiltily) eat meat, I am extremely proud of her. In 2014, 30,170 innocent cows were brutally murdered in slaughterhouses, for YOU to eat your steak, hamburgers, hotdogs, etc. 8,666,662 little chickens were slaughtered for your chicken nuggets. 106,876 sweet, adorable pigs were killed for your bacon. You may not care, to you animals may simply be meaningless, their only purpose being your food. But they’re not. Why are some animals okay to eat, and not others? Why would you happily eat a pig, or cow, but the thought of eating a cat or dog is terrible? In 2014, I stopped eating meat. 6-9 months before that I had stopped eating all meat except chicken. I honestly have no clue why I thought it was alright to eat to eat chicken. But, I did stop. Why did I stop eating chicken? A Bones episode. It depicted a warehouse full of chickens, each of them given less than a foot of space to live. It depicted baby chicks getting their beaks cut off, because when they got older, they’d fight each other, from the stress of not having any room to live. I don’t know if what they showed was true, I haven’t had the heart to research it, not wanting to think about what was truly going on. It was at that moment that I decided I couldn’t stomach the idea of forcing an animal to go through that, so I could eat something, I really didn’t need. The idea of their lives having to end, for them to have to stop existing, for a hamburger or chicken nugget. I don’t think it was hard to become a vegetarian, maybe it was because I hadn’t eaten cow, or pig in so long, maybe it was because I truly believed that it was just wrong and cruel to eat the carcass of a deceased animal. I think what was harder, was learning later on that there are things I didn’t know about that contain meat. Gelatin is in marshmallows and gummies, it’s made from boiling the tendons, ligaments, bones, and skin of pigs or cows. Lard is pig fat, it’s in a lot of Mexican food, being used to make quesadillas and refried beans. Truthfully, I didn’t know at the beginning, and I’m still finding out about new things that I can’t eat. If you want to count me actually becoming a vegetarian by when I stopped eating gelatin, or lard, fine by me. But I count it as when I decided it was wrong to. I’m not trying to turn you into a vegetarian, because I know it won’t work. I think I mostly just think everyone should understand what these innocent creatures have to go through for you to eat something, many of you take for granted. And if you start to question your ways, that’s just fabulous. 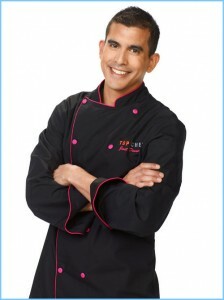 This season Top Chef Just Desserts features an Argentinian pasty chef. Nelson Paz is a native of Buenos Aires and a graduate of the Argentine Institute of Gastronomy. He’s currently pastry chef at the Mandarin Oriental hotel in Boston. So, needless to say, I’m going to root for Nelson this season. So far my impressions of him are mixed. In a challenge in which they had to create a dessert based on a fairy tale, he said he was from Argentina and therefore didn’t know any of them. And that’s kind of BS. Both the story of Little Red Riding Hood (Caperucita Roja) and Hansel and Gretel are very famous in Argentina, everyone knows them. I did have a book on Goldilocks and the Three Bears (Ricitos de Oro), though that may be much less common. Jack and the Beanstalk, on the other hand, was, indeed, completely unknown when I was growing up (though Nelson is much younger than I). That said, he might not have recognized the names of those children’s books in English. The show didn’t focus much on him, so it’s hard to know how good he is. He helped another contestant, Orlando Santos, build an amazing show piece, so he has some technical expertise, but it’s not clear how much of the design, if any, was his. Still, for the time being, at lest, I’ll be rooting for him. -I used to find garlic very difficult to peel, the peel would stuck to the cloves and I had to scratch it out sometimes. Now, I cut each end of the clove and the peel comes right out. Have I changed my technique or has garlic changed in the last decade? -I find that Martinis Kalamata Extra Virgin Olive Oil, which I buy at Trader Joe’s for about $9 for the 1 liter bottle, is the best cheap olive oil around. It actually has a pleasant (if not too strong) flavor, without the bitterness I find in other cheap oil. I don’t know if it’s not adulterated with other oils, as cheap olive oils are said to be, but it works well enough for me. -Isn’t it so much more convenient when you was your kitchen utensils as you use them? Why don’t I do it more often (other than having a full dish rack)? -The conventional wisdom is that you should throw out your dried herbs and spices every year. However, herbs and spices are expensive and it’s often much cheaper to buy them in larger quantities (specially at Santos Indian Spices in San Leandro, so I keep them for much longer. I, personally, haven’t encountered a significant degrading of the spices. And even if they lost some of their potency, isn’t it just a matter of tasting and adding some more if necessary? -The conventional wisdom is also that you shouldn’t cook with a wine you wouldn’t drink. However, I’ve found there is no difference in the finished product between nicer wines (those in the $7 range) and cheaper wines, in particular two-buck chuck. I personally think it’s a great cooking wine, both in its red and white varieties. -My palate may also not be very educated, but I notice little difference in the finished product vis a vis the varietal of wine I use – so I always use whatever I have open or I have a cheap bottle of. I do usually use red wine when a recipe calls for red, and white when it calls for white. -Pudding from a box is disgusting. It’s very easy to make your own custard. But the former is much cheaper and hubby likes it just as much. -Whipping cream and lemons cost twice as much at the supermarket than at Trader Joe’s. -No matter what I make, I need at least 1 hour to cook from scratch. -I always underestimate how long it’ll take me to cook something by at least half an hour. -I love Better than Bouillon stock bases. But they are expensive if you are actually using them to make soup. -I no longer bother making stock (with a base) before putting it into a recipe. Now I add water to the food I’m cooking and add the base when it starts to boil. -Chef knives are useless. I finally got one a year or two ago and I hate it. I find a serrated bread knife much more efficient for chopping onions (the onion halves stay together as you slice them), which is the kitchen task I most abhor. I have owned several kitchen timers over my 20+ years cooking, but none have lasted very long. Now this may be because invariably I’ve bought the cheap kind, or it may be because timers today are not made that well. For the last couple of years, though, I’ve been using my grandmothers old Magic Chef timer – which I would guess (by the style and my grandmother’s last trip from Argentina to America, where she bought it) dates from the 50’s or 60’s, for the last couple of years and I love it. It works perfectly every time, it runs neither quick or slow and it doesn’t stop. It has a loud but not annoying ring and I’m just happy with it. The kitchen timer is not in the best condition. It’s rusted in the back and the front plate is sort of lose. It’s lasted 50 years and I hope it’ll last a couple of more decades. I hope. I was reluctant to use the timer at first, just as I am reluctant to use any of my grandmother’s kitchen utensils. I brought them with me from Argentina after my adored aunt Gladys died because of the emotional attachment I had to them. I grew up seeing Granny and Gladys cook and bake with them, and when I look at them (the utensils) I can feel the warmth of their kitchen, and remember those sweet moments. But there is some sweetness in using the utensils, it’s almost like maintaining the connection between Granny and Gladys and I. So for the time being at least, I’ll continue using my timer. I don’t know why it’s so hard to find brisket in this part of the Bay Area – or even find out if it’s available. It’s Hanukkah, brisket is traditionally made for Hanukkah, you’d think stores would understand that, but noooo. The Safeways in San Leandro don’t carry it, the Lucky’s in San Leandro & San Lorenzo were out of it, Al Lunardi & Co’s, a local meat company, had it at $2.50 lb, but each brisket was between 12 and 15 lbs. Galvan’s, another local butcher, didn’t have it. The meat departments of P & W in Castro Valley, Draegers and Farmer Joe’s wouldn’t answer the phone. Sheesh! I finally found it (the flat kind) at Smart & Final in Hayward. The smallest brisket was 9lbs, but it was only $1.80 a lb, so I can’t complain. Now I’m not sure if I want to cook it all at once or cut it in two and freeze one half. I like having leftovers, but if we have too much we probably won’t eat it. Decisions, decisions!